Justin’s note: In April, we showed you why bank stocks need to be on your radar. Regular readers aren’t used to hearing us recommend bank stocks. But we showed you why they could become a top investment. Today, Palm Beach Daily analyst Nick Rokke shares more about this big idea… and offers a one-click way to play this trend. Last month, the president signed a bill into law that reduces regulations on all but the largest U.S. banks. The legislation eases oversight of all banks below $250 billion in assets. It also exempts small community banks from a host of strict rules and oversight established by the 2010 Dodd-Frank financial reform law. Although the new law decreases rules on most U.S. banks, the 12 largest U.S. banks still must comply with the stricter Dodd-Frank regulations. This is good news for small and mid-sized banks… and their investors. The new law will give banks more freedom to operate. More freedom translates into greater profits. And greater profits translate into money-making opportunities for us. The Ultimate Retirement Side Hustle? I’ve discovered a way you can pocket easy cash. You don’t have to leave your home or deal with difficult people. But you do need to see the video at this link. Hurry! It goes away at exactly midnight this Sunday… It could be your last chance to learn how to pocket as much as $36,000 or more in easy, extra money. And as you can see in the chart below, regional banks are up 15% since then. With the new law easing regulations on small and mid-sized banks, we think the industry will do even better. This is urgent. Evidence shows Amazon may be on the verge of issuing its own crypto coin and when that happens… it’s going to blow Bitcoin, Ether, and any other coin out of the water. Silicon Valley crypto expert Jeff Brown shows you two “backdoor” ways to profit from this extraordinary event. And it doesn’t involve buying a single cryptocurrency… Click here to learn how. Under the new law, small banks (those with less than $10 billion in assets) are freed from the so-called Volcker Rule. The rule restricts big U.S. banks from making “risky” speculative bets with funds from their own accounts through proprietary trading. The goal was to keep banks from the kind of hedging that endangered customers during the 2008 banking crisis. But the definition of “risky” was too restrictive. To avoid penalties, banks erred on the side of caution. This might sound like a good thing, but it’s not. Because the Volcker Rule is so broad, regulators can view anything but the safest investments as risky. So all banks crowded into the same lower-yielding investments. This rule costs the banking industry hundreds of millions of dollars in lost interest. Now, these banks can make reasonable investments with their capital. That gives them the opportunity to make more money with their reserves. Mid-sized banks also got a huge break under the new law. Under Dodd-Frank, regulators considered any bank with more than $50 billion in assets a systemically important financial institution (SIFI). These are banks deemed “too big to fail.” And they faced even stiffer rules. Rumor had it that some banks kept their assets under the $50 billion threshold to avoid SIFI designation. With those rules now rolled back, mid-sized banks can resume growing. One way they’ll grow is through mergers and acquisitions. I predict we’ll start to see a flood of acquisitions in the banking space for two reasons: regulatory rollbacks and tax cuts. Fewer regulations mean lower compliance costs for banks. Tax cuts mean banks get to keep more of their profits—and that all goes to the bottom line. With all that extra cash, banks will look for something to do with it. One way to utilize this extra cash is to buy small and mid-sized banks. The SPDR S&P Regional Banking ETF (KRE) is a one-click way to play this trend. The fund holds a basket of small and mid-sized banks. 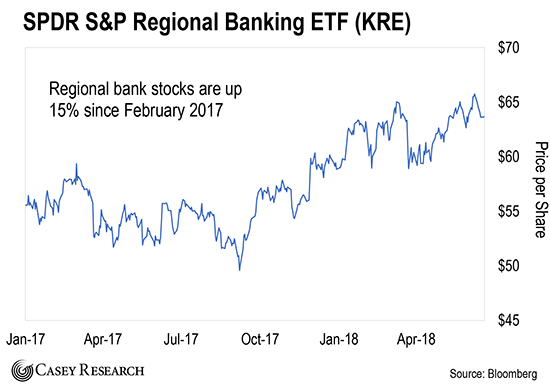 KRE should outperform the rest of the financial sector as decreasing regulations help to increase profitability… and allow larger banks to acquire smaller ones. Justin’s note: In a recent issue of Strategic Investor, editor E.B. Tucker recommended two bank stocks ready to soar in the years ahead. He says that this is one of the best setups he’s seen in banks in his entire career. Subscribers can read the issue here. If you’re not a subscriber and would like to learn more about these specific companies, click here to sign up for a risk-free trial of Strategic Investor. Are you going to start investing in the banking sector? Have you started already? Let us know how it’s going here.